Remember the fab DIY circular patio and firepit I shared last year? 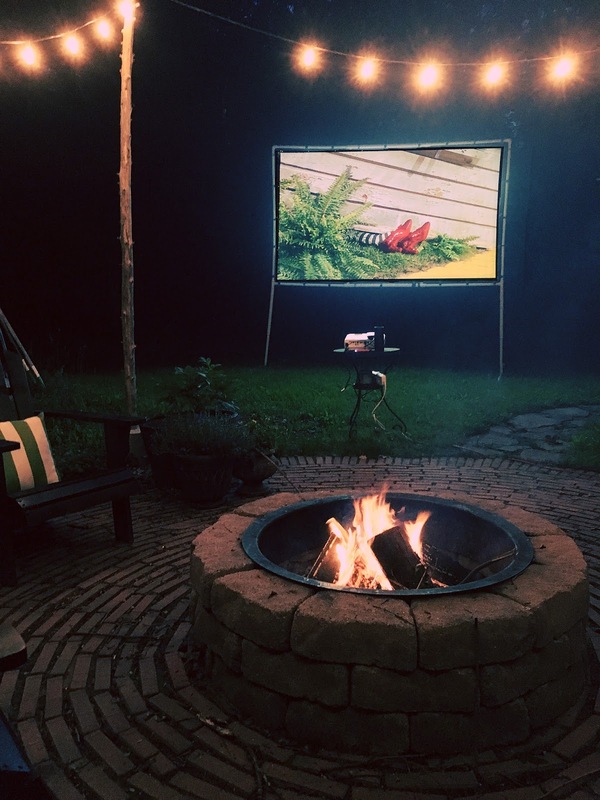 Well, it got a serious upgrade in the form of an outdoor movie theater set up this season. You will have to excuse the less than stellar image. The truth is, we were having too much fun out here and I just never got around to taking a great photograph. But I think you can get the idea. It's not something they keep up permanently but rather bring it out when the situation calls for it. I think Aggie's first viewing of the Wizard of Oz was certainly occasion enough. For those that are curious about the details, the projector is a refurbished home theater projector. I was really shocked how clean and crisp the picture was even with the ambient light around the patio in the form of the outdoor string lights. The only downside to this projector is that the built in speaker isn't great so my brother uses a separate speaker instead which worked perfectly. As for the screen I had just assumed they would hang a white sheet up between the trees. Little did I know that a sheet just won't work very well b/c the light goes right through it so they were going to need something a bit more heavy duty. They used this portable projector screen, added heavy duty grommets to the edges and built a frame out of pvc pipe that was easy to put up and break down as needed. With the fire roaring and everyone kicking back in the adirondack chairs, it's a pretty amazing set up. Ohmigosh, how awesome is that! I can't believe how sharp the picture is! Did Aggie manage to get through the Flying Monkeys without incident? I still have to leave the room at that part!